Since 1956 A call away from the best heating and cooling experts in Southern California. Reasons why GreenLeaf is your expert choice. Making sure you feel comfortable and understand what is happening with your systems. Making sure you have the right equipment for your needs. We’ve been serving your area since 1956. We work with trusted names in the business to make it possible for you to upgrade your equipment. Making sure your equipment stays in working condition and at peak performance. Our technicians are trained to handle all problems and get the job done right the first time! Original owner Rollie Dockstader teamed up with KD Miller, a local electrician, and brought an appliance store to Whittier. Douglas Farnik purchased the appliance store. Became a full service air conditioning and heating contractor. Introduced "Greenleaf Signature Series" our own products manufactured to our specifications. In this day and age, homeowners and commercial property owners rightly expect to be able to keep those properties comfortable all year long. It shouldn’t matter how chilly a winter night gets or how blisteringly hot the summer days are. You need to be able to provide a comfortable environment for your family, your workforce, your clientele, and/or yourself. With the help of the professional residential and commercial HVAC technicians on our staff, you can do just that. When Greenleaf Heating & Cooling first started out back in the early 70’s, we had just 3 employees and were mainly selling appliances. In January of 1975 we began offering residential air conditioning services as well as heating services, and we haven’t looked back since. We are now 15 employees strong, offering full residential and commercial HVAC services in Whittier, CA, and the surrounding areas. We fix it right the first time! When the heat of summer is at its peak, you need more than a decent air conditioner. You need a great AC that cools your home as efficiently as it does effectively. Scheduling your air conditioning installation with Greenleaf Heating & Cooling guarantees that your system gets off to a great start. In the winter season, or even on a chilly autumn night, your heater is going to have to step up to the task of heating your home successfully. It can be easy to forget about how important your heater is when summer is in full swing. Ignoring its service needs puts you at risk of discomfort when the temperatures drop, though. Temperature is a key factor in determining your comfort. It is not the only factor, however. The quality of your air is also a major player in your overall comfort, not to mention your health. As you can imagine, heating and cooling a commercial property demands more power than doing so in the average home. Commercial HVAC systems are large, costly, and complex. You need trained professionals with the right type of experience to handle your commercial HVAC services. One of the services we offer that sets us apart from the competition is our comprehensive maintenance program. HVAC systems require routine maintenance in order to function at peak performance and efficiency levels. 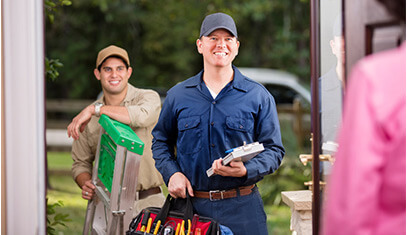 Our maintenance program makes it easy for you to keep up with the maintenance that your systems need. Ensure that your air conditioner won't break down when you need it.